When concert pianist Inon Barnatan was on the hunt for a Manhattan apartment, it had to satisfy one big requirement: enough space to hold a grand piano. He found this lofty condo at 140 West 124th Street, in Harlem, paying $1.182 million back in 2007, according to a profile in the Wall Street Journal. 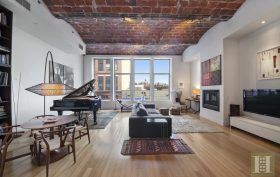 Located in a former warehouse built in 1906—that was allegedly used as a speakeasy during Prohibition—the two bedroom boasts historic barrel ceilings and a spacious living room fit for a piano.